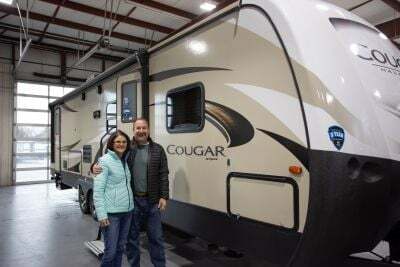 If you've got your eye on the 2020 Keystone Cougar Half Ton 29RLD Travel Trailer then Lakeshore RV Center in Muskegon is the RV dealer for you! We have the nation's lowest prices on all the top brand RVs with fantastic financing to meet every family's budget! We're conveniently located at 4500 E Apple Ave Muskegon Michigan 49442 and our friendly, knowledgeable staff can help make your RV dream come true! Stop in and see us today! 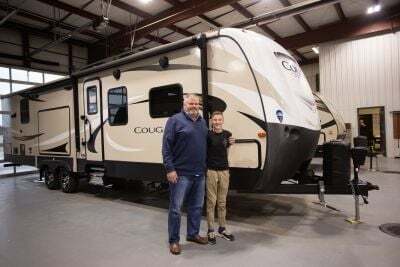 You'll be on the road to great family fun in your new 2020 Keystone Cougar Half Ton 29RLD before you know it! Towing this Travel Trailer is not an issue, with its hitch weight of 1085 lbs, dry weight of 7446 lbs, and GVWR of lbs. Enjoy some much-needed shade outside with the 20' 0" awning! There's plenty of room for everyone inside this 33' 5" long, 8' 0" wide RV! With 2 slides and a height of 11' 4", you'll be able to enjoy maximum living space! Fight extreme temperatures with the reliable 15000 BTU a/c and 35000 BTU furnace! 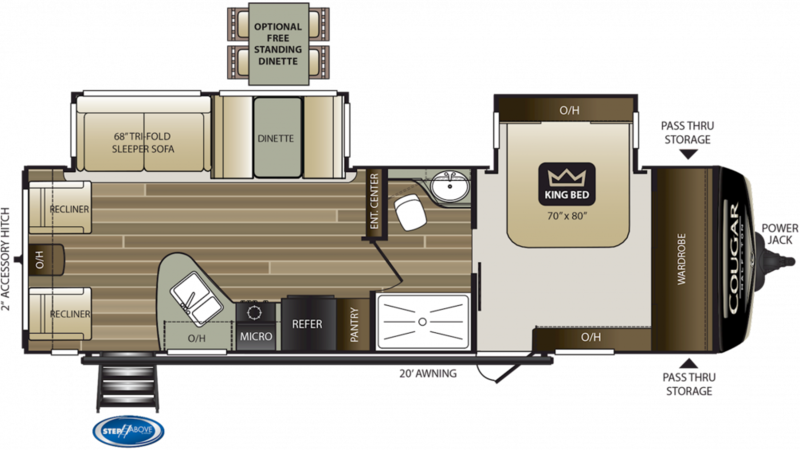 With a King bed as comfortable as the one in this RV, you'll never want to get up and leave the master bedroom! This isn't the only comfortable sleeping accommodation though. There are enough to sleep up to 6 people! You'll relish cooking hot, delicious meals in the 2020 Keystone Cougar Half Ton 29RLD because it has a wonderful kitchen with modern appliances, including a 3 burner range cooktop, 8.00 cu. ft. refrigerator, and more! Clean up's a breeze too, with plenty of fresh water from the 60 gal. freshwater tank! Should I buy from a Cougar Half Ton dealer near me? We actually encourage you to shop your local dealer. But make sure you talk to us about a Cougar Half Ton RV. 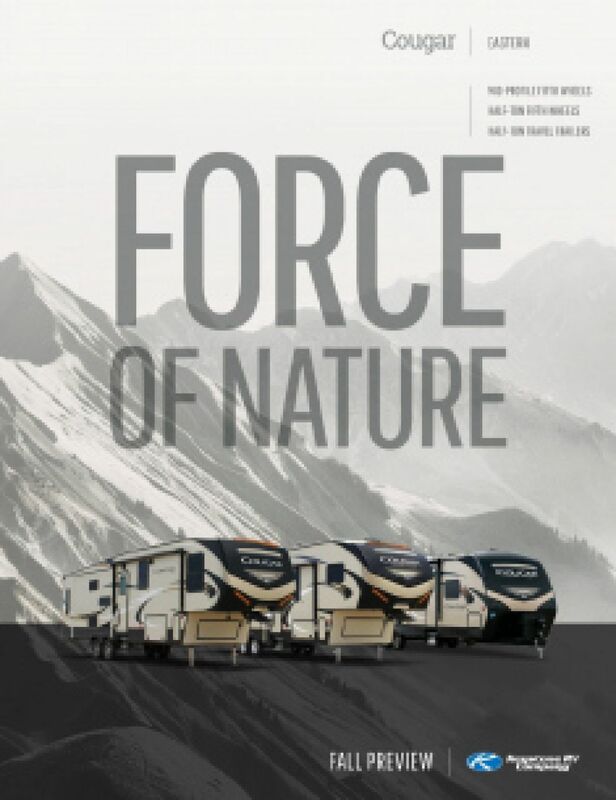 Visit our dealership, shop online or give us a call to talk about a Cougar Half Ton 5th Wheel or Travel Trailer. We offer the best prices, inventory, and nationwide delivery<sub>*</sub> to your door. What is a Keystone Cougar Half Ton? 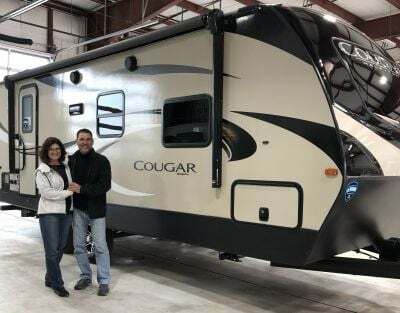 A Keystone Cougar Half Ton is a 5th Wheel or Travel Trailer sold by RV/Camper dealers in North America. What models does Cougar Half Ton provide? Cougar Half Ton manufacturered by Keystone has the following models 22RBS, 24RBS, 25RES, 26RBS, 26RKS, 26RLS, 27RES, 27RLS, 27SAB, 27SGS, 28SGS, 29BHS, 29RDB, 29RES, 29RKS, 29RLD, 30RLS, 32BHS, 32DBH, 32RDB, 32RLI, 33MLS, 33SAB, 34TSB. Where can I find a used Cougar Half Ton for sale? We often have used Cougar Half Ton 5th Wheel or Travel Trailer in stock. But if you find that we don't have any at present check back or we can put you on a waiting list to be notified when one becomes available. Check out other 5th Wheel or Travel Trailers as you will find our new inventory competitive in many cases with other companies used prices. Who makes Cougar Half Ton? 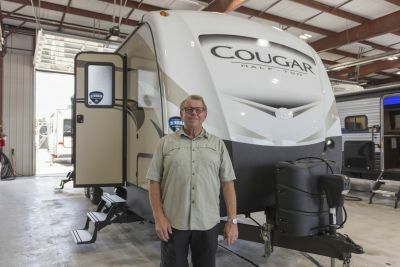 Cougar Half Ton RVs are manufactured by Keystone. Wonderful experience from initial contact all the way through to departure w/ unit! Best experience yet! Highly recommend these folks for all your RV needs and mostly your RV! Thank you!!!! service = excellent, sales = excellent, Facilities are neat and clean, Friendly and knowledgeable staff, would recommend. Very comfortable sales experience. Very good job answering all questions and explanations of trailer upon delivery.